What is an Accelerated Bachelor's Degree Program? A bachelor’s degree can open your world up to better job opportunities and get you closer to your desired career—but those aren’t the only reasons why earning a bachelor’s degree is important. Bachelor’s degrees are necessary for continuing on to complete a master’s or doctorate, and research shows that workers with bachelor’s degrees are generally happier in their careers. It can also earn you an average of $461 more per week compared to a full-time employee with only a high school diploma. To some, however, a college degree can feel out of reach. Earning a bachelor’s degree takes both time and money—two commodities not available to everyone—and trying to balance school in addition to an already busy work and personal schedule can feel overwhelming. A traditional bachelor’s degree is not your only option, though. Maybe you earned your associate’s degree and don’t know what your next move should be. Maybe you started your bachelor’s degree but never finished. Or maybe this is your first time delving into higher education, but you don’t have much personal time to spare. If any of these sound like you, an accelerated bachelor’s degree online can help you earn your degree in a quick and flexible way. So, what is an accelerated bachelor’s degree, and how do you know if it is right for you? 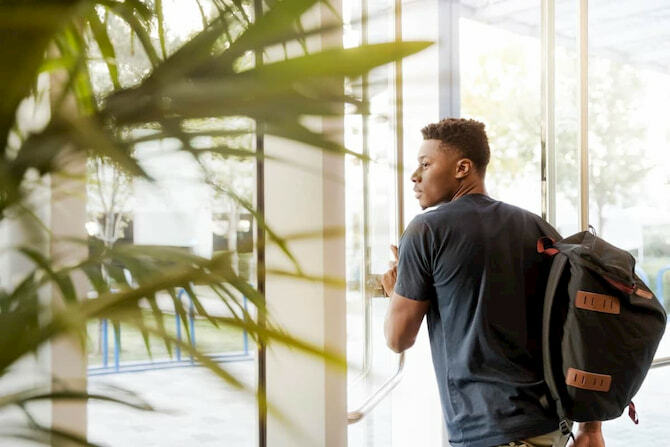 Learn more about accelerated degree programs, along with its pros and cons to decide if this is the best educational path to take to help reach your goals. What Is an Accelerated Bachelor’s Degree Program? An accelerated bachelor’s program allows students to earn a college degree faster by offering shorter classes and more flexible schedules. Traditional college classes are 16 weeks each and typically offered only twice a year—during the fall and spring semesters. Accelerated degree classes are offered more frequently, and are compressed into five-, eight-, or 10-week sessions. At this pace, an accelerated bachelor’s degree can sometimes be completed in as little as a year. That doesn’t mean that accelerated degrees are less work than a traditional bachelor’s, however. On the contrary, universities design their accelerated courses to cover the same amount of material as a traditional course—so they require the same amount of work, only compressed into a shorter time schedule. How Long Does It Take to Earn an Accelerated Bachelor’s Degree? Many accelerated bachelor’s degrees can be completed within 12 to 18 months, depending on how many general education requirements you’ve already fulfilled. Transferring credits from a program you may have already started, or testing out of classes through AP programs and CLEP exams can reduce the length of your accelerated bachelor’s degree. The program length will also vary based on which accelerated program you choose. Additionally, some online bachelor’s degree programs require observation hours or hands-on experience. Teaching degree students, for example, will need to complete in-class observations and practice teaching placements to fulfill state requirements. These extra steps could add time to your degree. How Much Does an Accelerated Bachelor’s Degree Cost? The cost of earning an accelerated bachelor’s degree online can be intimidating, but it is a worthy investment. The exact tuition price depends on the program type and how long the student takes to complete it, but accelerated degree programs can save students more than $15,000 by allowing them to complete their degree in a shorter time frame. Books, supplies, and lab fees also vary by degree type and should also be taken into consideration. Before you sign up for an accelerated degree program, weigh the pros and cons. Think about your learning style, current schedule, and weekly demands, weighing them against the benefits of an accelerated degree. Earn your degree faster. You want to get to your dream career as fast as possible and the only thing standing in the way is a college education. Accelerated programs allow you to graduate faster so that you can land a better, higher-paying job sooner. Boost your resume. “You’re able to enter the workplace and have, on your resumé, that credential that you’re working on,” says Evan Grenier, Director of Enrollment at Northeastern University. By adding your expected graduation date to your resumé and showing that you are working on your education, you can make yourself a more desirable job candidate before you even finish your degree. Start your education sooner. Since accelerated degree classes are offered all year, you don’t have to wait for a traditional semester start date. Grenier says that at Northeastern University, there are at least six start terms every year. “We process applications on a rolling basis, so there’s really no reason for students to wait,” he says. Earn credit for what you already know. Many accelerated programs allow you to test out of competencies or move quickly through coursework you are familiar with already. This allows you to focus on learning new material. Perform better. A study published in Teaching of Psychology found that the students’ retention rates for an eight-week accelerated psychology course were higher than the same course spread over a 16-week time period. Experience less downtime between semesters. As a child, did you have a hard time getting back in the school groove after a long summer? One of the perks about accelerated degree programs is that as soon as you finish one term, you start another. You don’t have to work at building your concentration back up after a long break. Set your own schedule. While you must complete certain assignments per week, you can choose your hours of study. If you have a full-time job, you can finish your school work on the weekends or your lunch hour. If you are a parent, you can earn your degree after the kids go to bed. Complete your degree anywhere. Don’t live near a university? That’s okay. Since accelerated degrees are done online you can earn credits wherever you have an internet connection. Network with other adult learners. College is a wonderful place for learners of every age. However, many adult learners and older students feel out of place in a college setting. For adult students returning to school after a hiatus, an online accelerated degree can be an easier transition. Save money. Students who earn an accelerated degree online can cut costs in a number of ways. Since you are in school for a shorter duration, you end up paying less in the long run. Since the degrees are earned online, room and board are nonexistent costs. You must be a self-motivated learner. Online classes take discipline and self-motivation. With traditional on-ground courses, classes usually meet once or twice a week. With an online course, you set the pace. You decide when to sign in, listen to the lecture, and do the coursework. Being able to motivate yourself is absolutely necessary. Shorter classes mean heavier workloads. “Accelerated programs can be more challenging for those that don’t have the time to dedicate to it to be successful,” says Grenier. Some students find it difficult to keep up with the amount of work they’re assigned in addition to their already busy schedules, and occasionally need to drop out of the accelerated program if life interferes with their degree progress. Grenier says that at Northeastern, students are allowed to stay in the program but decrease their workload. They can go as fast or slow through the program as they want. Courses are faster paced. Some people learn best when they have ample time to absorb the material—those people may find an accelerated program is not a good fit. This is also true for those who need a break between courses. Accelerated classes move from one term to the next with little downtime in between. Online courses provide less face-to-face interaction. Since accelerated bachelor’s degrees are completed online, some students feel they miss out on face-to-face interactions with their peers and professors. While there are many advantages to earning your degree online, online learners must be willing to put in the effort to enjoy the type of in-person socialization provided in a traditional classroom format. Is an Accelerated Bachelor’s Degree Right for You? On average, graduates with their bachelor’s degree earn 56 percent more than individuals with a high school diploma. Over the course of a lifetime, this difference can amount to $1 million in additional earnings. Students who earn an accelerated degree enter the workforce sooner than their counterparts in traditional degree programs, meaning they can start earning more sooner. Making the commitment to advance your education and career isn’t as simple as taking a few extra classes. Earning a bachelor’s degree requires time, effort, and money. And while an accelerated degree can save you both time and money, it requires a substantial effort. Weigh your personal commitments against your educational and career goals to determine if this is the right choice for you—but ultimately, pursuing your education is always worth it, no matter how you achieve your degree. Ashley Eneriz is a content contributor for Northeastern's Lifelong Learning Network.